The Texas Auto Writers Association has announced its annual Spring Round Up award winners yesterday. After reviewing 50 vehicles, the Fiat 500 received two of the competitions eight awards: Best New Design and Best Value. It was the only car out of the 50 to receive two awards. The Texas Auto Writers Association is a well known media organization that promotes quality, accuracy and professionalism among automotive journalists. May 4, 2011 , Auburn Hills, Mich. - Members of the Texas Auto Writers Association (TAWA) voted the new 2012 Fiat 500 (Cinquecento) “Best Value” and “Best New Design” at the 2011 TAWA Spring Roundup hosted at the Texas Motor Speedway. The Fiat 500 received two of the competitions eight awards. The 2011 Spring Roundup event was held May 2 at Texas Motor Speedway and featured more than 50 vehicles from various manufacturers, all vying for a top award from more than 50 of the TAWA journalists in attendance. With beautiful Italian styling, timeless functionality, efficient design and innovative technology – the same attributes that made the original version an icon – the new Fiat 500 is relevant for an entirely new generation of drivers. Modernizing the successful formula from its past, the new Fiat 500 caters to an entirely new generation who want their vehicle to be as engaging, individualized, ecologically responsible and technologically savvy as they are. The new 2012 Fiat 500 offers high levels of safety, fuel economy, quality and advanced technology. With its city-friendly four-passenger A-segment size, engaging driving dynamics, all-new fuel-efficient 1.4-liter MultiAir® engine with eco:Drive™ Application, state-of-the-art TomTom® Navigation with BLUE&ME™ Handsfree Communication technology and seven standard air bags, the new Fiat 500 offers a driving and ownership experience unlike anything available today. This package is further enhanced with new quality and refinement adaptations for the U.S. market, including an all-new six-speed automatic transmission. Every new Fiat 500 includes FIAT FORWARD CARE™ – a standard four-year/50,000-mile bumper-to-bumper warranty, four years of unlimited roadside assistance and a three-year/36,000-mile maintenance program that includes wear-and-tear items. 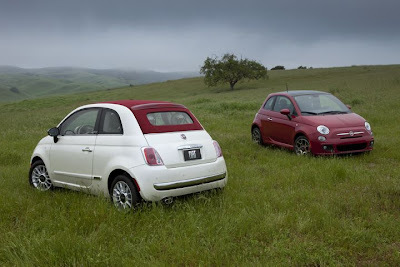 The 2012 Fiat 500 Pop model has a MSRP of $15,500 (excluding $500 destination) and is available at FIAT Studios nationwide. The reintroduction of the FIAT brand in North America is led by the modern generation of the Fiat 500, followed by the Fiat 500C (cabrio) in spring. I believe it going to take more than the Fiat name to go against the Mini Cooper S or the Abath version against the Works Cooper S.